How bad is the damage ? If there's no crack, your good to go. Drop that bad boy back in the drink and power on. We all hit bottom, run aground or hit something submerged at some point, the scratch I see taint nutten, crank her up. That's the main reason the skeg is there. It helps protect the prop from damage. It looks like it did its job. If that is all there is you are fine. That should have done nothing but add a little character, as long as there are no cracks you should be fine. That skeg is basically to protect the prop and more importantly the output shaft from damage. In a way it is nothing more than sacrificial. I ran a boat with no skeg at all for many years. Can we ask how you lost it. Boating stories have great potential! 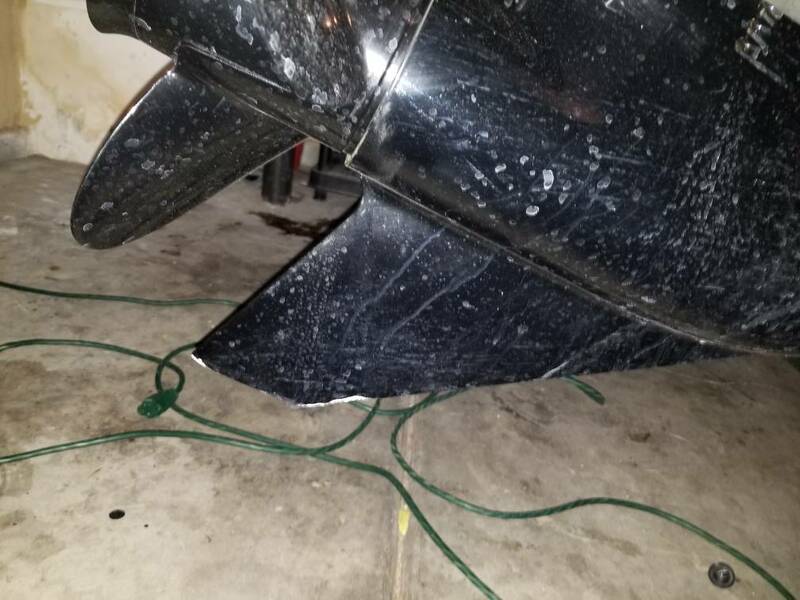 I snapped 2-3" off the skeg on an old Suzuki 25 hp on a 13' Boston Whaler when I clipped the side of a huge round rock in the Delaware River. We found the piece but I never had it welded back on because it gave me extra clearance. I've seen a lot of marks on that rock so I know I'm not the only one who hit it. How much extra clearance do you get, and extra 1/2"? Remember, the prop isn't that much higher up then the lowest point on that skeg. I actually got the full 2-3" of extra clearance because it broke off even with the prop. The skeg really hung down much lower than the prop on that Suzuki motor. I wish it was more interesting but I bought the boat and motor like that. Was it hamlet or romeo who said "tis merely a flesh wound!" I have repaired several that had various degrees of damage to them. Usually they were the result of motor toters that bounced off and the skeg hit the pavement or they backed into something. Surprisingly few were from actual boating incidents. That one there if it were mine at most would get smoothed down and a little paint on it. Oh yeah...I seen a guy a few years back pulling a runabout behind his truck. The trim cylinders apparently had leaked down during trailering and the outdrive was dragging the highway. Guy must not have realized it. The skeg was half gone when I seen it....guy promptly got on the interstate and went on with life. Would imagine the prop and remainder of skeg were permanently damaged. A coworker seen it just as I pointed it out and he was hysterically laughing as it was a buddy of his. He tried to call but no answer. I didn't think it was really that funny but I don't know the guy either. Maybe he don't care? Dunno. My old yamaha is dinged just like the one in the picture...been that way for at least 8 years that I know of (I bought it in '10 and have used it since). To my knowledge, it hurts nothing. But I may weld it up one of these days and then smooth it back down to see if there's any difference in the way it operates, steers, top speed, etc.